Okay, a few weeks back I was in a battle where a couple CA/CL's on my team were whittling down a BB. A T4 KM BB I think it was. The BB managed to hide from them, but since I was in a snail US T5 BB I was behind the battle and had a good shot at the KM BB that only had a sliver of health. Hit it and took it out as you're supposed to try to get enemy guns off the battlefield. Looking at the results after the battle I noticed I did a whopping 18 damage to the KM BB. 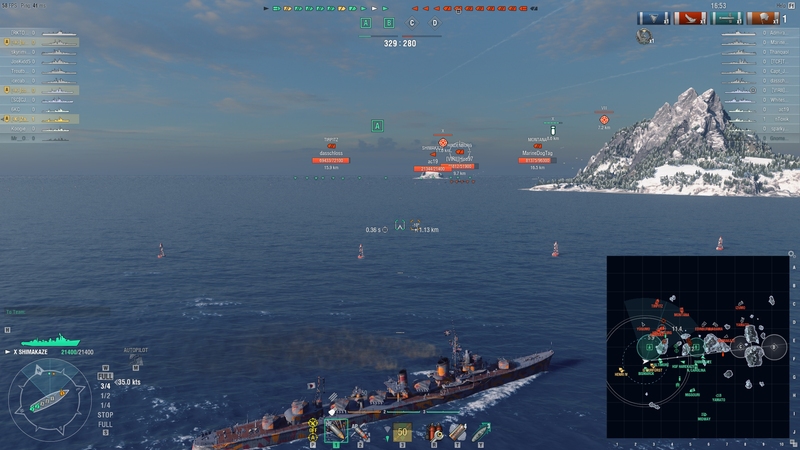 I was going to start a thread asking if anyone had sunk a ship by doing less damage. Then last night I sunk one doing 17 damage to it (this time a DD). So just curious, anyone else recall sinking a ship and doing so little damage? I thought, given the sheer volume of battles having been played, that someone sunk a ship on one point. Just curious as to what others have experienced here. Thought I must say, no in either case brought out the salt bag and started shouting "kill stealer". @Zampy, with a Shimakaze torpedo. I agree. You can only equal but never better that. Yea I've sunk ships with only a few points left on 'em and never felt guilty. Because I've managed to live with a few points and still sink ships. I actually earned a Kraken from kill securing. A ship with even one hitpoint left can still shoot and is still a threat. Most of the time when I sink a low-hitpoint ship that's been causing a lot of damage to the team I get a "ty." There are a few times when someone has asked me if they could get a kill on a ship I've been working on because they needed one more for a Kraken. If I'm not in any immediate danger, I always them "sure go for it." I've done it at least 3 times. Even in my short career, I've been at 10 hp, put my shots in the air, knowing that the ones I could see coming would probably finish me...then got that sweet sound of another ship sinking after my death. So, yeah, if it floats, kill it. Along with your Kraken, if you are among the top two or three on your team in points or get a High Caliber or a Confederate then you have significantly damaged the enemy and are not kill stealing. Along with your Kraken, if you get a Close Quarters Expert then you have been at the front lines of the fight, probably soaking up damage that otherwise would have gone to your teammates, and you are not kill stealing. Conversely. If you get a Kraken and are low-mid-level in points earned with no awards then you probably are kill stealing. Which happened to me in my Farra (we still lost).